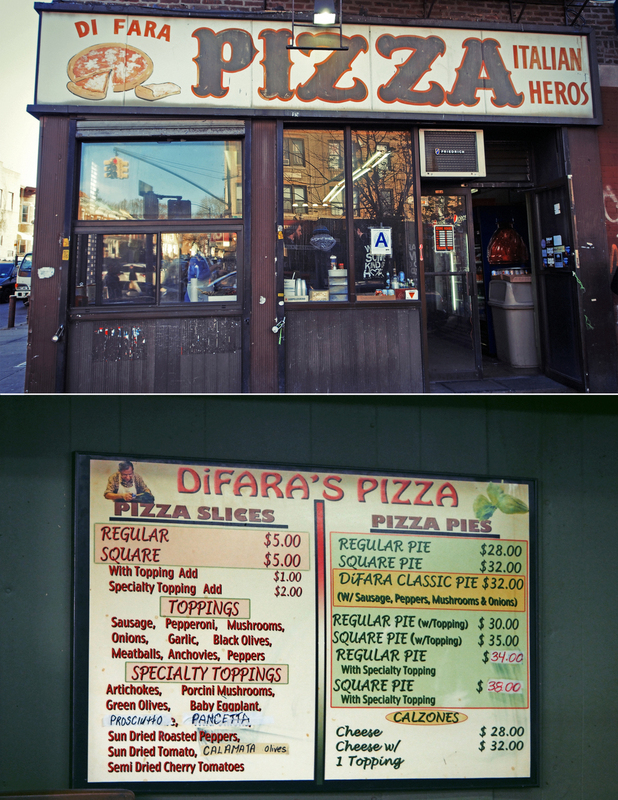 Diehard pizza aficionados swear it’s the best pizza in NYC, if not the world. 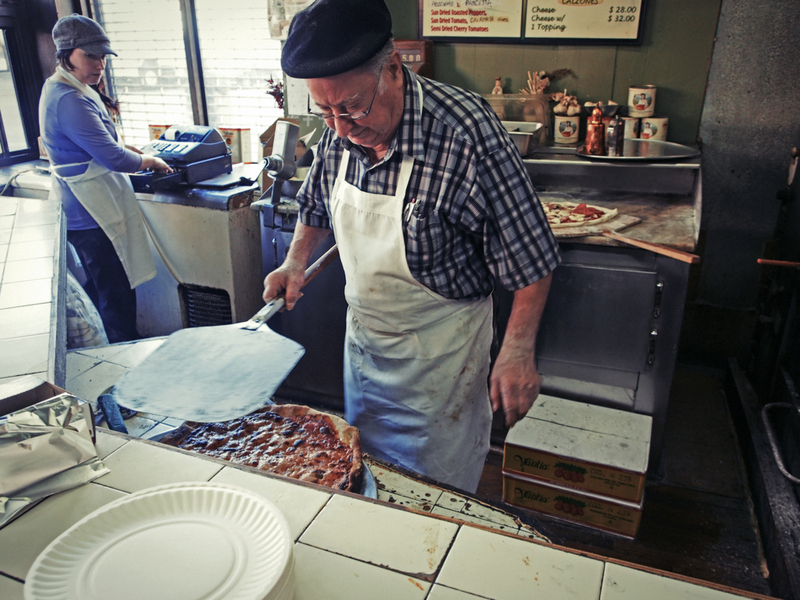 Ranked near the top of numerous polls as the pizza to beat, Di Fara’s claim to fame is the uncomplicated use of quality ingredients as well as the tender loving care given to each pie by Dom DeMarco, an old-school pizzamaker. The first time I heard about this pizza institution was back in 2009. Many plans to taste this mythical pizza were made throughout the years, then quickly scrapped because of its inconvenient location deep in the heart of Brooklyn. My chance finally came in the fall of 2012. My friend Doug was moving to LA and requested a pilgrimage to this pizza mecca before he left. Accompanied by Sam, a fellow pizza lover, we set off on our trek via the Q train. We must have arrived at an off-peak time because the excruciatingly long line mentioned on Yelp was non-existent. As we stepped into the restaurant, we were transported back in time. 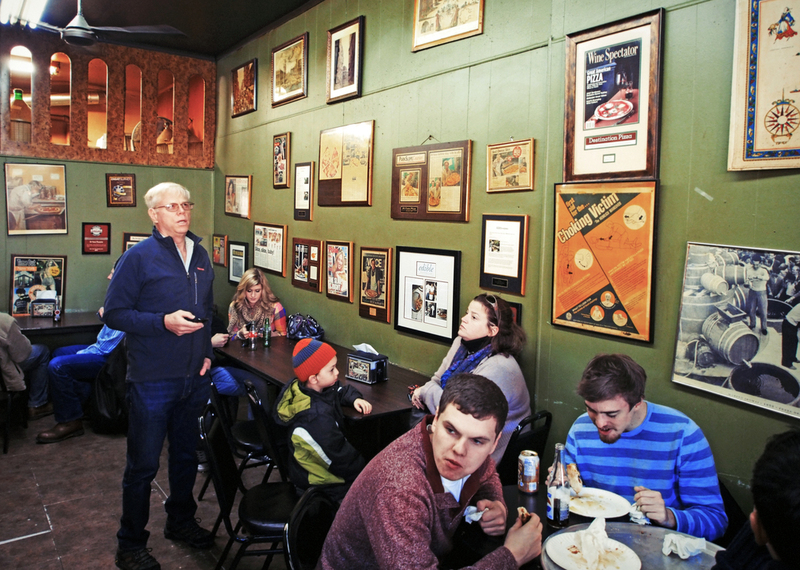 Framed reviews and magazine articles of decades past adorned the faded green walls, creating a sense of history and legitimacy. Fragrant basil greeted us at the counter as we placed our order of one Di Fara Classic Pie (sausage, bell peppers, mushrooms, and onions). In hindsight, we should have ordered a plain cheese pie, a mistake that we didn't realize until later. Watching a master like Dom at work with pizzas was an honor. His movements were deliberate with no action going to waste. 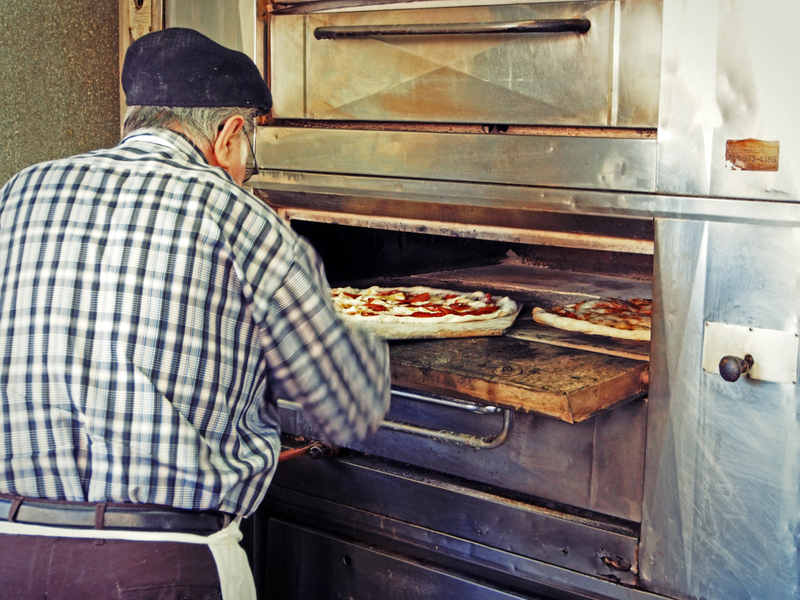 Forming the dough from scratch, ladling the fresh tomato sauce, scattering the cheese and toppings and placing it delicately into the oven...these were all actions he must have performed thousands of times and perfected down to a science. The whole process was conducted in silence, interrupted by the occasional grunt of approval as Dom passes the pizza to the welcoming hands of hungry customers - many who have braved the 1 hr travel time and 1 hr waiting time. After 30 minutes, our pizza was ready. Our anticipation crescendoed as we saw him scatter the fresh basil leaves and top the pizza with a few streaks of extra virgin olive oil - the final strokes of his masterpiece. Carrying it carefully to the table, we let the pizza rest a bit, the basil still quivering slightly from the bubbling cheese underneath. Unable to deny our desire any longer, we tore into it. The fresh sauce, pillowy dough, and crispy, charred crust were mouth-wateringly delicious. The mild acidity from the sauce complemented the savory cheese. Unfortunately, the water content from the onions and bell peppers, coupled with the streaks of olive oil resulted in a limp, soggy slice which served as a slip-n-slide for the cheese to slide on our plates with a soft thud. A puddle of oil pooled on our plates as we switched to knife and fork since folding the pizza was no longer a viable option. My lofty expectations were dashed to pieces as I stewed in silence and finished the slice with a swig of Pepsi. But that wasn’t enough to wash out the taste of disappointment.